The cross marks the spot where this church used to stand. Hi Webmaister, you might be interested to know that I was a member of the 228th BB when it belonged to Newlands East Church on London Rd. 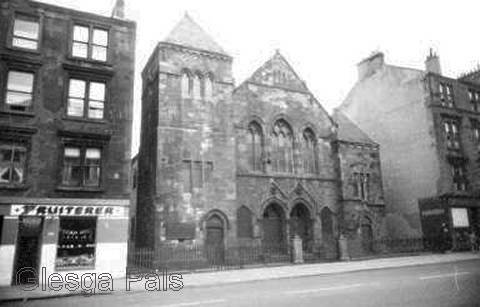 The church was between Frazer St. and Stamford St. Moore's fruit shop was on one side and Dr. Stirling had his place on the other side. The minister was Rev. John McKechnie. See photograph of The Boys Brigade c1948 marching into this church. Extract from messageboard, Sept2006, Charlie McDonald London. Webmaister both my maternal and paternal grandparents were married in Newlands Church. My Ma and Da were also married there and I was christened there. Mention was made of the Rev.MacKechnie I remember reminiscing with auld Bobby Bryson about him and Bobby who never had a bad word to say about anyone said 'Aye he was an ok Minister but his sermon's knocked everyone to sleep'. 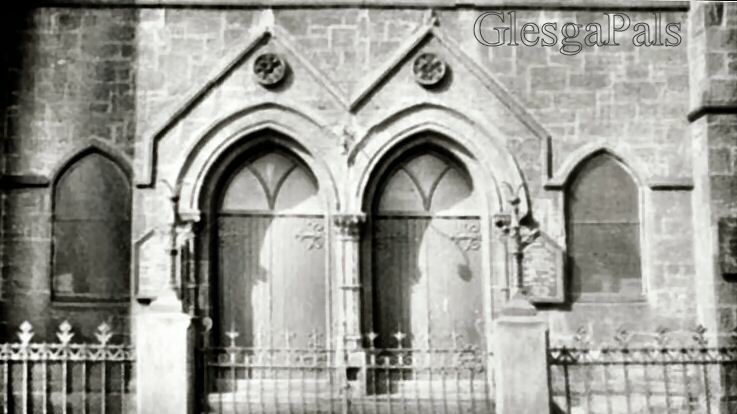 The font from Newlands that I and most of my family were christened in was in Calton Parkhead Church up until about 3 years ago when it was sold to some junk man out of the Evening Times - I was raging and asked who bought it - funny they couldn't remember who it was they sold it to. Aye right. One of my auld yins who attends my club was at the Sunday School Xmas Party in the late 1950's when I was 'the little boy that Santa forgot' and I screamed the place down. 150 weans at a party and yours truly never got a present - organised religion I have hated it ever since. Extract from messageboard, Oct.2006, Ronnie McPhee London. Aye well Webmaister, yer photograph of Newlands East Church in the London Road fer evokes many a memory of my gallivanting in that locality as a youngster. I knew the area ever sae well, and was in Moore's the fruit shop many a times for a quarter of totties, two ingings and a hauf of cabbage. And it wis from Moore's that we got oor Apple boxes (stronger than orange boxes) for making guidies. And tae the right haum side was Dr Stirling and Dr Turners Surgery where I was once escorted by my mammy having gotten my foreskin stuck, and wee Stirling placed my w/ullie atween his middle and index finger and chugged it back intae position...ouch! And the dour brown painted waiting room that for certain brought oan a feelings of depression, even though you were in there only tae have a bandage changed. And the frequent jumble sales held in the church, wae a mile long queue waiting for a bargain, that were I assure you few and faur between. They were great fun for me though having skipped in, and streeching my haun through the crowds of wummin tae nock an auld toy aff the table. And the regular big white weddings, six big fancy motor cars, and photographers....phew! how could local folk afford this? And best of all the scrambles...and aw us weans waiting in anticipation for the haun-fae of coins getting flung oot the car windies, and we'd be fighting and groping oan the grun tae get as much money as possible, and oan many occassions for me it was as much as a shullin....smashing fun. And then through the close aside Moore's tae the 'Buggy Lawn' (as named by Rick Sutherland oan 'Friends'), a wee group of 'hooses' behind the tenement's. And aw the wie through up past the steamie towards hame in. In yer map of the area Webmaister it gives the impression that Stamford Street came aw the wie doon oan tae the London Road, When in fact between Barrowfield Street and the London Road this was a very narrow lane wae two upright wooden posts that we as weans vaulted awer each time we passed. It was just at this bit of the London Road that a wee boy from Law Street who wis in my class at Barrowfield School, was killed by a lorry, and his mother having gone intae moarning was never again a well woman. happy times :) sad times :( right's of passage. I collected my school prize from Bill Tennent at this church. My granny and granda stayed directy across the road in the Hairy Ham. There was a lean too building attached to the tenement leading round the back to my grannies wooden stairs. The lean too housed a fishmongerers in wich my ma,s younger sister served her time, (Jean Morrison (Graham). Next to the lean too was Tommy O'Neill's newsagent. The lane leading from London Road to Stamford Street was called the Brickie named after the Brickfields that used to be in Barrowfield. If you walked up the Brickie on your left was the back wa of the Steamie named the 'hoat wa' where us bad boys sat and blethered. There used to be fist fights and tossing schools (coins) in the Brickie mainly on Sundays. The two brothers Moore that ran the fruit shop were highly respected because of the help they gave during the War.